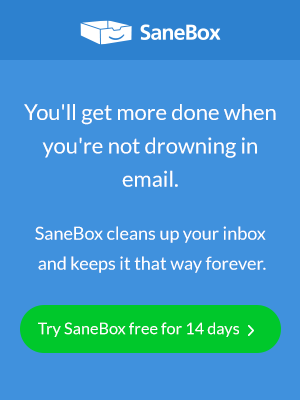 We here at SaneBox think you should spend as little time as possible on your email. You have better things to do with your time! So we take the unimportant stuff out of your INBOX so it won’t distract you. And we send you an email digest of the unimportant stuff so you can quickly search for nuggets of gold. Now you can move those nuggets to your INBOX from the digest!!! If you are like me and you want to stay in your INBOX whenever possible this new feature is a huge boon. With one click in your email digest (Arrow #2 in the picture), you flag and move any unimportant email and our email monkeys will move that email to your INBOX and flag it to make it easy to find. You can still “train” a particular kind of email (Arrow #1 in the picture) to your INBOX from the digest with a single click. And when you do that **all** emails of that kind will be deemed INBOX-worthy. Now you have to find something productive to do with all this time we are saving you. Remember your family? your job? an old friend? Previous Entry What Does Your SaneBox Ranking Mean?